Eric Bach is a personal trainer, author of The Power Primer, and fitness business consultant in Denver, Colorado. His passion is simplifying fitness, helping clients get great results through the ruthless execution of the basics. Find out more on his website Bach Performance, or hang out on Facebook. You don’t need dumbbells or barbells to build a stronger, more defined chest, bigger shoulders or powerful looking arms. Before the invention of the barbell and dumbbell, humans relied on their body weight for exercise. When it comes to body-weight training, the shoulders are often one area that isn't hit directly with your training. Push-ups are typically known as a chest-building exercise, but they also target your shoulders. To maximize the recruitment of your shoulders, or even to isolate them, during push-ups change the angle at which you perform the push-up. Below are several push-up variations that target your shoulders more directly than the standard push-up. The pike push-up is the best way for any beginner -to-intermediate trainee to target their shoulders with only their body weight. It’s also the first stepping stone for building the strength you’ll need to perform the handstand push-up. Handstand push-ups display tremendous amounts of strength and build the anterior deltoid, the front of the shoulder, primarily. But, they're also the hardest push-up to perform. To maintain shoulder health and safety, it's best to build up to them. Get into the standard push-up position on the floor --- arms straight and hands shoulder-width apart. Lift your hips up so that your body forms a V-shape, similar to the downward facing dog yoga position. Keep your legs and arms as straight as possible in this position. Bend your elbows and slowly lower your upper body towards the floor. Your goal is to get your head as close to the ground as possible. Take a brief pause, and then push yourself back up. Stop once your arms are straight. Decline push-ups are a push-up variation that like the pike push-up can be performed anywhere. All you need is a chair, a bed, a workout bench or a pair of stairs. This push-up variation also targets your shoulders and are a fantastic way to build towards the handstand push-up --- the ultimate body-weight shoulder exercise. Kneel in front of a chair, a stair, or your bed; place your hands on the ground in front of you. Place your feet on an elevated surface. Elevating your feet shifts your center of mass slightly forward -- leaving most of your body weight resting directly on your shoulders. Lower your body until your chest touches the floor. Push yourself back up to the starting position to complete one repetition. This push-up variation uses the support of any vertical wall for balance. It makes building the necessary shoulder strength and stability for the handstand push-up more manageable. The farther away your hands are from the wall, the easier the exercise. Place your feet up against a wall. Your hands should be 1 or 2 feet away from the wall with your head in between your hands. Lower your body until your chest or nose touch the floor. Then push yourself back up until your arms are fully extended. The height of your feet dictates the difficulty of this exercise. Performing decline wall push-ups causes more blood to rush to your head, which you may find uncomfortable. Start with only a few reps until you get stronger and better acquainted with this exercise. Start with your feet closer to the ground on the wall to make this exercise easier at first. As you get stronger and more proficient, move your feet up a few inches on the wall to increase the difficulty of this push-up. The handstand push-ups is the king of all body weight shoulder exercises. In this inverted position, your shoulders support every pound of your body weight. 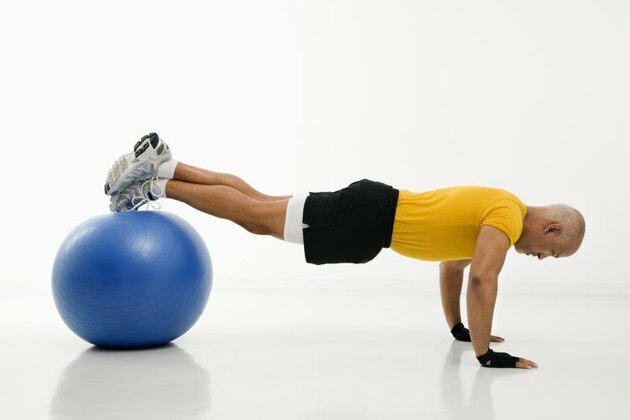 And, all the muscles of your shoulder girdle also act as stabilizers to keep your body balanced. Before you even attempt the handstand push-up, you should be able to hold a handstand for at least 20 to 30 seconds. If you can’t do a handstand, then the first two exercises above will be enough for training your shoulders. Get into a handstand position. Bend your elbows to lower your head to touch the ground. Push through your hands and shoulders to raise your body back to the full handstand position. Perform two to three sets of four to eight reps.
How Many Push-Ups Should I Do a Day to Get Ripped?